I've had a succession Palm PDAs over the last five years, and I've become more and more dissatisfied with the hardware and, perhaps more importantly, the user interface as it lagged behind the expectations raised by Nokia's Series 60 smart phones, and Apple's Powerbooks and Mac OS X operating system. I'm not even going to go into the horrible development environment and the ghastly mess that writing code for a Palm OS device turns out to be, even compared to writing J2ME for Series 60 device, let alone the simplicity and rapid development offered by the Python for Series 60 port from Nokia. So with the last of my data copied off my ageing Treo and wrapped safely inside Apple goodness I discovered I was carrying the PDA less and less. The canonical version of my "life", my calendar, address book, and the other meta-data you accumulate was all on my laptop. 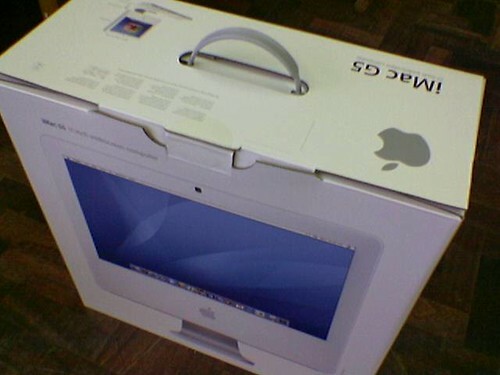 This was fine to a point, but even the 12" Powerbook is a bit bulky to carry around everywhere, and you don't really want to pull it out of your rucksack when you're down the pub. There was something missing, I really did need a PDA it seemed. The latest release from Palm, the Lifedrive, wasn't really what I was looking for, and some of the same user interface hassles that were depressing me about my Treo seemed to be still hanging around. The cost? Because of the crazy way that the UK mobile industry subsidises their handsets to new (and existing) customers, I picked up this bleeding edge £400 (US$700) device for free. Which is a lot less that I would have had to have ponied up to get myself a Lifedrive. Potential Linehaul Delay Due To Technical Problems. Our new iMac, which will be doing double duty as a file server and a development box for the astrophysics cluster, is currently sitting in Pudong International Airport just east of Shanghai, its been there a while now. Update: ...its now been for a couple of days. Does anybody know what a linehaul delay actually is? or how long it might last? After lots of last minute problems trying to find a venue, the Call for Proposals for the London Perl Workshop 2005 finally went out yesterday evening. This year's workshop will held on Saturday 26th of November at City University, rather than Imperial College like last year. Update: ...and this time there might be Twister! Update: The provisional talk schedule has now been published. No, not that sort of Grid, the more traditional sort. With wind turbines and photovoltaic panels becoming more wide spread the BBC asks "Can a home wind turbine make money?" With the growing interest manufacturers of small wind turbines are stepping forward to provide solutions like the WES5 Tulipo which is specially designed for urban environments, and despite our dismal weather here in the UK, coupling a small wind turbine with solar hot water or photovoltaic systems could make you almost entirely self-sufficent for power. With the recent petrol protests there has been a resurgence of interest in biomass energy and Biodiesel. Unfortunately most of us don't have several acres of land to grow our own biofuel. Therefore a good alternative to selling the excess energy from your wind turbine or solar panels back to the National Grid would be to couple them with an electrolyser to produce hydrogen for fuel and invest in a car which run on fuel cells or via Hydrogen internal combustion. Of course both of these technologies have some way to go to reach even the level of consumer acceptance that wind and solar power have obtained. Update: More from Wired on biodiesel as a replacement for heating oil. First look? I'm impressed, if they can get it all working. Integrating del.icio.us and using it to tag and store your bookmarks is a no-brainer and the integration of Blogger and Flickr is pretty slick, or at least it would be if I could get it to work properly. On start-up Flock repreatedly asks me for my del.icio.us and Flickr passwords, despite having them stored in the password manager, and I can't get the Blogger toolbar to work at all as trying to start it up and login to by account freezes the browser solid. However these are teething problems, the look and feel hints that when its all working, I'm probably going to have to switch browsers. Hopefully they can get the Mac OS X integration up to speed, as its lack is why I'm still using Safari rather than Mozilla. So if you haven't got a @gmail.com email address already, then from today you'll be a second class citizen with a @googlemail.com address instead. Or will the new addresses perversely become more sought after? In the lead up to the first ever EuroOSCON which will be held in Amsterdam a few days from now, Nat Torkington talks about the differences between this new conference and the traditional US OSCON. For those of you who might want to get on TV, and love travel, Channel 4 are currently recruiting for a new series called 'The Search'. The programme is an international treasure hunt, and they are currently assembling two teams and are on the look out for people with specialist skill to contribute such as archaeology, ancient history, problem solving, architecture and cryptography. Are you excellent at puzzle-solving, do you enjoy team-work, would you like to travel the world? We are looking for 10 bright individuals to take part in 'The Search', a new Channel 4 programme. Each week our contestants will be taken to a new country rich with history and intrigue, where they will participate in an elaborate treasure hunt. If you're interested in applying drop me an email, or leave a comment, and I'll pass on the contact details. You'll have to be quick though, the first episode will start filming on the 21st of October. The handbook includes a helpful list of phonetic Russian phrases such as "Olya che-VOH EH-tah KNOHP-ka"? Which means, "What does this button do? The Space Tourist's Handbook is available on Amazon priced at $10.85 in the US store, or £6.99 in the UK store. Which doesn't really make me very happy, especially since it let me browse the store without a problem, the only indication I got that it wasn't going to let me buy the show was when I tried to pay for it. That is pretty poor design, and very frustrating for the user. Of course the question you have to ask yourself is, why? Why am I not allowed to do this? It doesn't make sense, I want to give someone money to buy a product and they won't let me because I live in a different country? What happened to the global economy? Update: For those of you that can buy episodes, C.K. Sample talks about the video quality over on the Unofficial Apple Weblog. It looks like we have a new iMac, thinner, and with an iSight built in along with a Bluetooth remote control for the new Front Row application allowing you to remotely control your music, pictures and video. 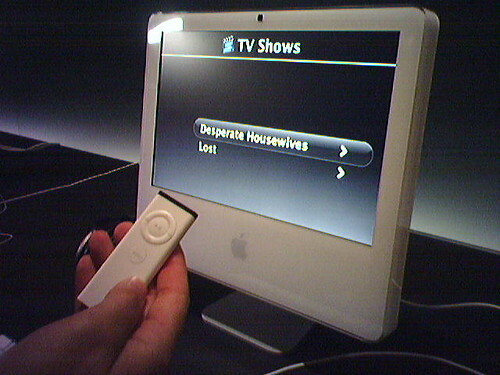 Update: This post refers to a previous generation iPod, however you are probably looking for news of the latest iPod, which was announced during the Apple special event on the 12 September 2006. An all new wide screen iPod? More hints that we're looking at some sort of new iPod from iLounge (via Apple Matters). 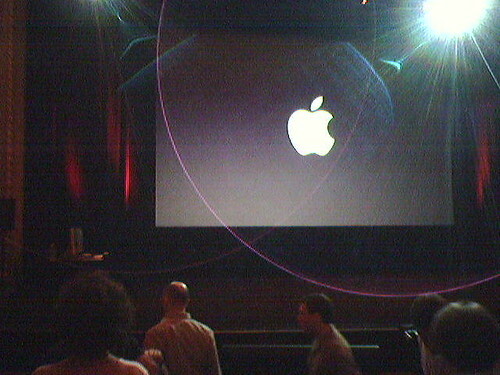 iLounge has snapped exclusive photos of advertisements that seem to be promoting a new iPod, which rumours indicate will be introduced today at Apple's "One more thing" event in San Jose, California. 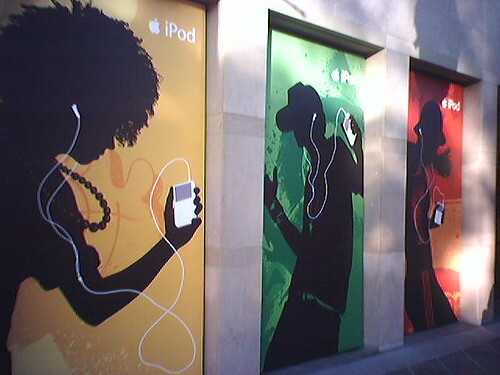 The familiar silhouette posters seem to show an all-new iPod model with a noticeably larger display compared to the current models. Update: ...and this looks awfully like a pre-production sample. A while ago Google introduced a personalised search service. I'm actually too paranoid about the amount of information Google now holds about me to actually use the service, but apparently they have now added tagging to the bookmark section. Having had a look around the new additions, I think del.icio.us still has an edge, in my view it's properly Web 2.0, despite not being an AJAX application, because it has open API. If there isn't an API, how do we build mash-ups? Personally I'm still betting on the launch of the much rumoured iPod Video, although of course I've been wrong before! Update: Last minute rumours seem to indicate that we're looking at a new wide screen iPod? So today I greeted The Register's report on the successful test flight of the scale model of the Japanese SST at the Woomera Test Range in Australia with mixed emotions. Well done to JAXA and the Japanese, but why isn't it us any more? Jim Lanzone recently spoke at the Web 2.0 Conference on the blogosphere, asking the question, which feeds matter? He's assuming that Bloglines is a statistically neutral cross-section of people who read feeds. What evidence does he have for this? For instance Safa Rashtchy's session at the same conference seems to have proved, amongst other interesting things, that teenagers don't use Yahoo. However people do seem to agree that Google Maps is, at least currently, the only funtional Web 2.0 platform, they also agree that this has to change. A good reference for finding Web 2.0 services is the Mashup Matrix, which show how the different 'base' services have been combined by people. My favourite right now pretty much has to be Placeopedia, which connects Wikipedia articles with their locations. Of course, Web 2.0 can't be just about mash-ups, Slashdot recently talked about early AJAX office applications with predicable results. Perhaps there might have been a more positive response if someone had mentioned Basecamp, Backpack and Writeboard and Ta Da Lists from 37signals? Or the resurrection of Desktop.com? Back in June there was a good bit of controversy about a stealth start-up called 24 hour laundry. Well a couple of days ago they launched their service, intriguingly called Ning. I immediately grabbed an account and beta developer status and tried to have a poke around, but it turned out I couldn't log back into the site after registering, so I wandered off and did something else for a while instead. We've built an online service (or Playground, as we like to call it) for building and using social applications. Social "apps" are web applications that enable people to match, transact, and communicate with other people.